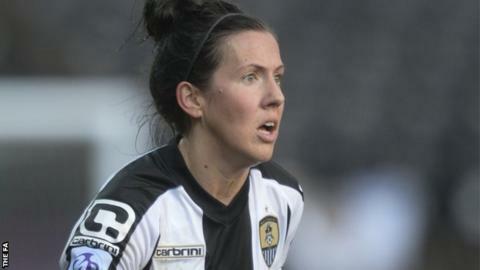 In her first year as a professional, the 27-year-old midfielder has helped Notts to the first Women's FA Cup final to be played at Wembley. The Scotland international said: "I don't even know if it [playing at Wembley] would have been a dream because I'm more of a realistic person. "For generations to come I thought the game would develop and expand." Talking to BBC East Midlands today ahead of Saturday's FA Cup final against Chelsea, Crichton continued: "Growing up I never thought it would be something that I would be able to tap into as a footballer. Crichton, who helped Glasgow City complete their third consecutive domestic treble in 2014, says playing as a full-time professional at Meadow Lane is a "luxury". She said: "It has been amazing. I was worried coming away from home. It is my first year as a professional, so it was always going to be a challenge." Saturday's game will be the biggest Women's FA Cup final in history, with more than 26,000 tickets already sold. Crichton believes the women's game in England has been transformed following the national team's bronze medal at the World Cup and the FA Cup final will be another seminal moment. "The event and day itself will be one to remember," she added. "There will be a lot to take away from it, win or lose. It will change the game for the better for the future."